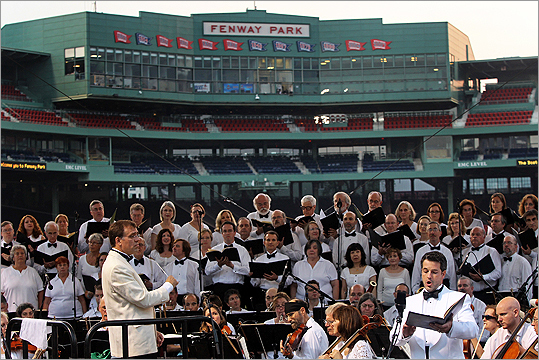 As Boston landmarks go, there are none more iconic than Fenway Park. So it was an instant milestone for the Boston Landmarks Orchestra when the group played on a balmy Wednesday night what was billed as the first symphonic concert in the park’s storied history. All 15,000 free tickets were snapped up in four days. Those who made their way into the bleachers on Wednesday found the orchestra perched on a temporary stage built over the bullpens. It felt like a civic event as much as a musical one, as Mayor Thomas Menino and Governor Deval Patrick were both on hand to honor Charles Ansbacher and the orchestra for their work over the years serving up free summer music to thousands of Bostonians. Christopher Wilkins, who directs ensembles in Orlando, Fla., and Akron, Ohio, also led portions of the program. The concert itself was mostly an easygoing mix of light classics and Americana — music that was once at the center of the Boston Pops repertoire but now occupies a more peripheral place. Ansbacher made no apologies for presenting Leroy Anderson’s spirited “Chicken Reel’’ or the “Hoedown’’ from Copland’s “Rodeo’’ alongside two Rossini overtures. For his part, Wilkins led selections from the final movement of Beethoven’s Ninth Symphony, with the New World Chorale and vocal soloists Jayne West, Mary Westbrook-Geha, Matthew DiBattista, and Robert Honeysucker. There were a few choppy moments but in the end these ardent vocal forces carried the day. After intermission Wilkins led “The Jackie Robinson Story,’’ a narrated work adapted from modest but effective music by Julian Wachner, with a new text by Swanee Hunt. Governor Patrick delivered the narration, ranging over most of Robinson’s life including a section on how members of the Red Sox management “hurled racial slurs’’ when he came to try out for the team. Works by Bernstein and Chabrier followed. During the encores, Ansbacher threw his own curveball, conducting the famous opening of Beethoven’s Fifth Symphony and then cuing a surprise dance beat. It was in fact “A Fifth of Beethoven,’’ the ’70s disco takeoff by Walter Murphy. The audience loved it and was dancing in the bleachers.